I am seated on a park bench near a section of seawall adjacent to the NOAA dock in Woods Hole, MA. 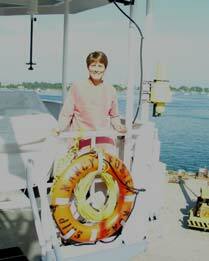 The NANCY FOSTER is secured to her moorings and the crew is working to prepare her for the next research cruise. As I gaze across the dock at my home for the past week, I am in awe at the opportunity NOAA provided me through the Teacher at Sea program. What a marvelous experience and one that I will not soon forget. I am extremely grateful to NOAA for providing me with a research experience that will help me with science curriculum design and the development of activities and lessons to assist my students in gaining a deeper understanding of the technologies used in the ocean exploration. I am also thankful that the NOAA scientists allowed me to take such an active role in their research. They were most helpful in teaching me the logistics of remote sensing technologies and also provided some terrific teaching ideas to help middle school students grasp such an evasive concept. In all honesty, I was not ready to disembark the NANCY FOSTER this morning. 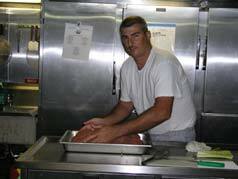 I truly loved the experience of living at sea and conducting research for NOAA scientists. During my adventure, I never felt like an outsider. The NOAA corps, crew, and scientists allowed me to settle in quickly and become a part of their research team. I am forever grateful for their hospitality. NOAA’s Teacher at Sea program has been a wonderful experience that I would highly recommend! Today was our last day of remote sensing along Stellwagen Bank and everyone was hoping that our towfish would find something along the seafloor. By our second run of the day, our towfish successfully located “something” along the seafloor but it wasn’t quite what we had in mind. As Chief Scientist, Matt Lawrence watched the cable length read out begin to climb shallower and shallower, he realized our towfish had captured some fishing gear. The towing operations were stopped, the ship reversed course and we retrieved the towfish so we could remove the line of fishing gear that had wrapped around the towing shaft. 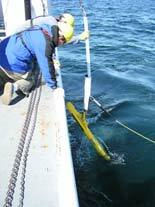 Once removed, the sensor was re-deployed and maritime archeology research continued. The fishing gear must have been synonymous to a lucky horseshoe because we began locating several possible wrecks shortly after freeing the sensor from the gear. In actuality, it is the fishing gear used by local fishermen that gives the scientists a starting point for their searches. Local fishermen keep logs of “Hang” areas they try to avoid so as not to get their fishing gear caught up in the debris. Fishermen share their “Hang” logs with the scientists who can then use the fishermen’s data to set up remote sensing search areas and transect lines. Fishermen have years of experience from fishing local waters and have become a valuable resource of information for the scientists to use in their quest to preserve the maritime heritage of the Stellwagen Bank National Marine Sanctuary. More Transect lines were the plan for the day and we placed the fish in the water before 0700 for our first run at “mowing the lawn” along Stellwagen Bank. We ran 15 more Transect lines today, continuing our search for ancient maritime artifacts. We were blessed with a gorgeous day on the ocean and no logistical problems with the equipment. I began conducting interviews with the crew and scientists while continuing to assist the scientists with various remote sensing duties throughout the day. I created an interview database and began interviewing various members of the NOAA Corps, crew, and scientists, starting with one of the most important members of the NOAA crew: Chief Steward – Jesse. I also asked each interviewee to describe the most unusual (e.g., funny, scary, weird) occurrence that happened to them while at sea. I am composing a Top Ten list that I will share at a later posting. After an overnight anchoring along the shores of Scituate, the NANCY FOSTER headed further offshore for another day of scanning the seafloor for ancient maritime artifacts. The sensing equipment was deployed over the Stellwagen Bank region by 0800 and we collected data until dusk. We covered 13 transect lines today, each taking about 30 minutes to cover. 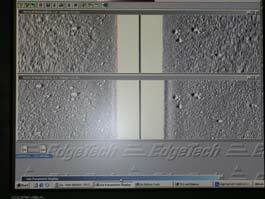 The side scan sonar ran beautifully all day without interference. The magnetometer was also working well but the data being fed from the 2 towfishes was not synchronizing when it arrived to the computer. The decision was made to disconnect the magnetometer and run the side scan sonar alone for most of the day. I took sometime to look over the Stellwagen Bank National Marine Sanctuary information the Scientist Deborah Marx shared with me. I recommend that you follow this website to learn more about this remarkable area of the New England coast: http://www.stellwagen.noaa.gov. We awoke this morning in a heavy layer of fog which has taken most of the day to burn off into an overcast sky. While the low visibility posed additional caution to the ship’s crew, the scientists continued to scan the seafloor in search of maritime heritage resources (shipwrecks). Four sites were investigated today…. The sensing equipment needs to be towed at a slow and steady speed of about 4 knots. NOAA’s crew can maintain this speed in calm seas with little current using the main engine only. As seas pick up or current increases, the NANCY FOSTER gets a bit squirrelly and can slide off course from the predetermined transect line. Using the Z drives allows the NANCY FOSTER to run a steadier course. The electromagnetic field generated by the ship’s Z drive creates interference with the remote sensing equipment, especially the side scan sonar. NOAA engineers are onboard and have been experimenting to find a happy medium so that the Z drives can be used for better tracking but will not interfere with the remote sensing signals. After several trials, the issue was resolved and the NANCY FOSTER is tracking smoothly along the Stellwagen Bank National Marine Sanctuary while the side scan sonar and the magnetometer are searching away for more seafloor anomalies. I am truly amazed at the teamwork between the scientists and NOAA’s crew. From a teacher’s perspective, I see a group of people who are willing to do anything possible to help a group of scientists complete their investigation. I also see a group of scientists who are most appreciative of the overwhelming effort exhibited by the crew and willing to share various aspects of their research that the crew finds interesting. 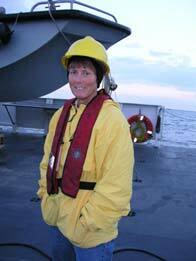 This cooperative environment generates an atmosphere of respect and camaraderie that is conducive to individuals sharing their individual talents in a collaborative effort toward the success of the entire group on board the NANCY FOSTER. What a pleasant setting to be a part of during my first adventure at sea. I am onboard NOAA’s R/V NANCY FOSTER and am heading toward the Stellwagen Bank National Marine Sanctuary. This sanctuary is located off the east coast of New England between Cape Ann and Cape Cod, Massachusetts. I will be exploring this area with a group of NOAA and National Marine Sanctuary (NMS) scientists as they search for various anomalies located along the seafloor. “Anomaly” is the term used to describe artifacts or other materials that do not follow the normal pattern of the seafloor topography or geology. My Teacher at Sea assignment with the NANCY FOSTER will allow me to observe and assist the scientists using remote sensing equipment to detect these anomalies. Today, we traveled from Woods Hole, MA through the Cape Cod Canal on our way to Stellwagen Bank where we began our search for seafloor anomalies. Transect lines are coordinates determined by the Chief Scientists, Matthew Lawrence, and are provided to the ship’s captain for steering our course to the correct location. Two different remote sensing instruments were used in our first set of transect lines: the side scan sonar uses sound waves to record images along the seafloor and the magnetometer detects electromagnetic fields that might be emitted by the anomalies. 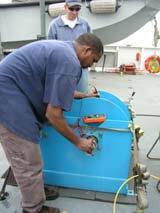 As the plotted site is reached, the ship’s engines are slowed and the “towfishes” are lowered off the stern of the boat using a cable and winch system. (See photos A, B, and C) The goal of our first search was to try and locate a NOAA data collector buoy and anchoring wheel that failed to surface when NOAA sent a radio signal for the buoy to release from its mooring. The buoy was used to collect data on cod fish that were tagged to determine their general range within the sanctuary. The data would let scientists know if these cod used the sanctuary as a habitat or if the fish were just passing through. After several passes, or transect lines, we were unable to locate any significant anomalies that might have indicated the location of the wheeled mooring and the buoy. The remote sensing equipment was brought to the surface and stored away for the night. Our ship is now heading closer toward shore to anchor overnight.